ReactCasino Welcome VIP Bonus: 100% up to 3.000 EUR’s! Join the epic battles between Gladiators of Ancient Rome with this online 3D video slot from BetSoft. 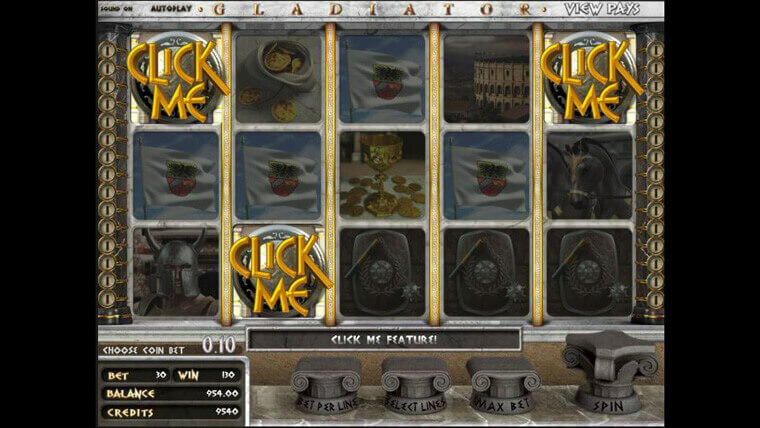 Despite its modern 3D graphics, Gladiator has a classical structure of 5 reels and 3 rows and is playable only on Desktop devices. The gameplay is packed with bonus features and is playable from as little as €0.02. Princess Wild – acts as a wild, when landing anywhere on the grid. However, landing the Princess Wild on the top row will turn it into an expanded wild, covering all the reel it has landed on. Gladiator Battle – is triggered by landing the Colosseum, the Gladiator and the Villain symbols next to each other. A mini game, where you choose to be either the hero or the villain will open up. You will collect the prize if the character you have chosen is victorious. Click Me Feature – triggered by landing 3 or more Wooden Door symbols. A mini game where you click coins and reveal prizes will open up. Picking the same amount 3 times, means you collect that as a prize.